Recently I commented in one of my podcasts that I wasn't finding much of interest in the Photography category of the Mac App Store. I must not have been looking close enough. Because hiding there, just waiting to be discovered, is FX Photo Studio ($9.99 US) and FX Photo Studio Pro ($39.99 US). Each brings a ginormous collection of easy to apply photo effects, snappy performance, and an easy to use interface. The Import Photo button lets you tap your Aperture, iPhoto, or Lightroom library. It's well implemented, allowing you to browse folders, projects, albums, and collections. The file size that gets handed off to FX Photo Studio is the preview resolution that you establish in your photo management application. Also, this is not a roundtrip. Once you import the file into FX Photo Studio, you have to save it to a destination, that is, unless you use iPhoto. In that case, you can export directly from FX Photo Studio (either version) back to iPhoto. The application also allows you to import directly from a device, such as your digital camera. Both versions of FX Photo Studio have 172 effects organized into 21 categories. As you might imagine, this is the strength of the program. It provides thumbnail examples of each effect applied to the image that you're working on. Once you choose one, it renders a larger version fairly quickly. You can then fine tune the look with adjustment sliders that accompany the effect. There were many that I liked a lot. You can apply multiple effects to a single image. And if you come up with something that you really like, you can save it as a preset for later use, or for sharing with a friend. The Pro version includes a number of image adjustment sliders that include the controls that you'd expect such as exposure, temperature, saturation; plus highlights, shadows, sharpening, and more. These work fine on both Jpegs and Raw files, but they are for fine tuning your image rather than replacing your primary image editor. Photoshop and Aperture will still sleep well at night. Both versions include some nice touches such as an attractive full screen mode, real time zooming (including trackpad gestures), side by side comparison, and direct sharing to the major social network sites including Flickr, Facebook, and Twitter. You can also email a photo directly from FX Photo Studio using Mail.app. Unless you need to process Raw files in FX Photo Studio, the standard version for $9.99 should provide you with all that you need. It interacts with iPhoto, Aperture, and Lightroom (using their previews), has all 172 effects, plus includes the above-mentioned goodies, except for the additional image adjustment sliders. If you want to open Raw files directly in the app, then you will need the the $39.99 Pro version. I think FX Photo Studio is worth the ten bucks for the effects alone. Plus I very much enjoyed the speed of this application on my MacBook Air, not to mention the handsome, easy to use interface. 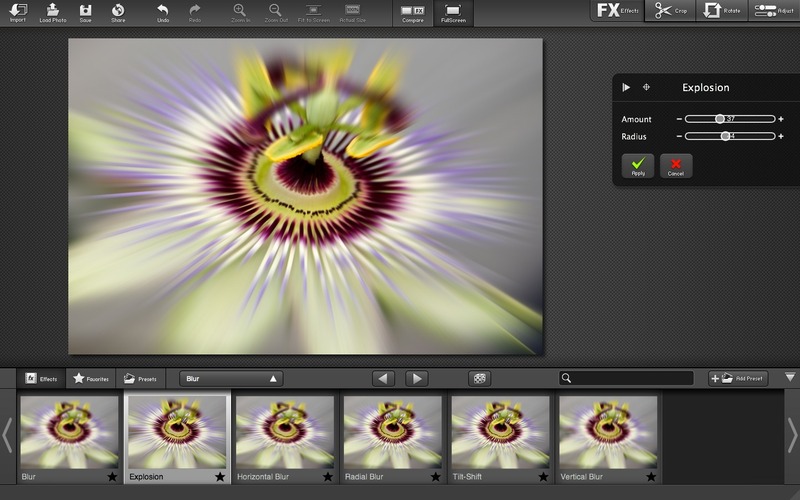 FX Photo Studio is a gem awaiting your discovery in the Mac App Store.